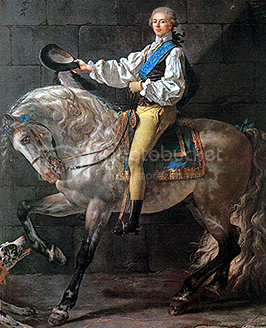 Edvard IV of Arendaal ("The Musical King") (1730 - 1782) was the King of Arendaal between 1762 and his death in 1782. He was the son of Queen Regent Beatrix I of Arendaal and Thomas Knytling of Franken. He is best remembered for his devotion to music, which earned him the nickname, the "musical king". He commissioned numerous operas from numerous prolific composers, acting as the most prolific patron of Arendaal's famous composer Wolfgang Amadeus Mozart, as well as one of the major patrons of Joseph Haydn. 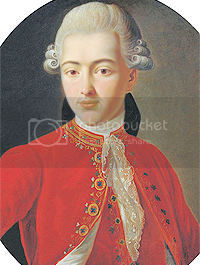 Like his mother and grand father, Edvard IV was a prominent proponent of enlighte -ned absolutism. He continued their many modernizing reforms, but in terms of innovation and effectiveness, he was less successful as a ruler than his two illustrious House of Nareath predecessors. In spite of new wealth generated by the growth of the KNH, the expenses of his government quickly spun out of control. This strain on Aren coffers would worsen during the reign of Edvard's immediate successors and would serve as a major impetus for the Revolution of Light in 1800. At the time and in historical memory, however, Edvard IV was a popular ruler. 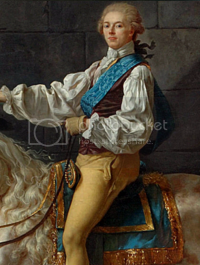 He was handsome, dashing and charming, a consumate "golden boy" in every sense, whose confidence and fun-loving nature attracted courtiers, and whose leadership qualities and kind-heartedness made 'ordinary' citizens sincerely attached to him. 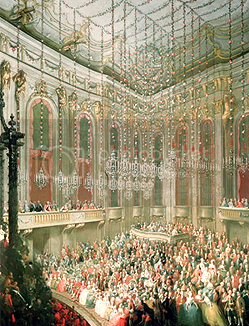 In line with his famous musical patronage the King established the Aren ballet and operatic schools that would soon become famous throughout Europe and which retain this popularity even today. Edvard IV also continued in the footsteps of his predecessors in the realm of social reform. He strengthened rules which banned discrimination against Jews, Catholics and other religious minorities, improved the quality of sanitoriums and educational facilities and encouraged the promulgation of enlightenment ideals. Edvard IV was an imposing but likeable personality, though critics claimed he had been spoiled by the indulgence of his parents. He was very close to his siblings, especially to his brothers Hathor III and Trigve, of whom he was by far the most out going. 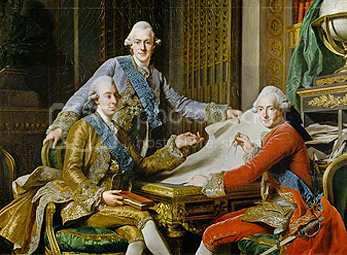 The famous portrait aptly titled "The Three Brothers" (below) shows the three in their twenties, and is still on display at Karlheim Palace. 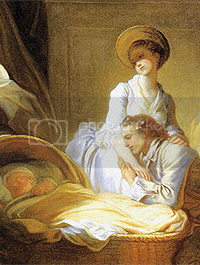 In his personal life, Edvard IV faced tragedy when his first wife, Evelynn of Anglyn, died in 1763. She suffered a series of miscarriages and general ill health througout her marriage. Given her untimely death, she became a favourite tragic heroine in Aren literature. Of her death the King said: "I could not be more saddened by a death. It seems ridiculous that a beautiful woman, in the midst of a splendid life, should fade away so suddenly". A year after Queen Evelynn died, Edvard married Victoria of Breotonia by whom he had issue. Though both marriages were generally happy ones, his wives were perpetually distressed by his many casual affairs. 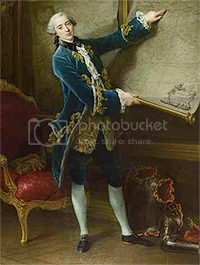 Edvard IV, who was vigorous, lusty, and accustomed to having his own way, had many mistresses. This was especially the case during his first marriage, when he and Queen Evelynn failed to produce any children. His behaviour was somewhat more upstanding with his regards to his second wife, whom he may have sometimes treated inconsiderately, but never cruelly. 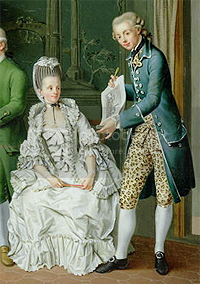 Edvard's mistresses were rarely his mistresses for long, and exerted little influence over him or over courtly life in general. Queen Victoria reigned supreme at Court and ladies whom she suspected of 'familiarity' with the King were routinely dismissed from the Royal Palaces. In addition to the musical flowering that his court is remembered for, Edvard IV's court is known for its spectacular fashions. 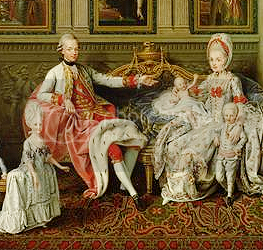 In this, like in artistic patronage, the aristocracy continued to expand upon the opulent traditions of the King's predecessors Gustav V and Beatrix I. Fashion in his reign reached heights of fantasy and abundant ornamentation, with wigs, powder, huge elaborate gowns and immense hairstyles. 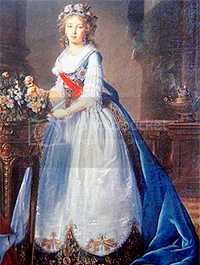 It was only after Edvard IV's reign that a long-simmering movement toward simplicity and democratization of dress began, commencing in the reign of Edvard's daughter Queen Helene I and flourishing later under his nephew King Karl V.
King Edvard IV of Arendaal was married twice. 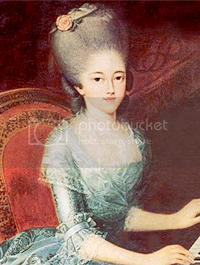 With his first wife, Princess Evelynn of Anglyn (died in 1763), whom he married in 1746, he had no issue.